North West Tasmania is an instant remedy for city-sore eyes, and as I rolled the ute off the night ferry I was confident I’d packed everything I needed; I had a tent, I had Reb and I also had my nomadic parents who were crossing my path for the first time since last February. We began our reunion by traversing the bumps of Tassie’s agricultural region that claims the cleanest air in the world (this wasn’t hard to believe). Just a short slope from the main roads we’d find ourselves alone on chilled, arching white beaches watching crowds of waves protest upon the shore. This was far away from my expectations. 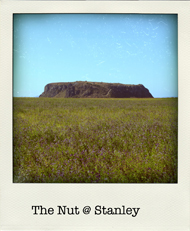 In the small town of Stanley we scaled The Nut, a 13 million year old circular rocky headland that rises 152 meters above the Bass Strait. Its windswept crown covered in a wild meadow, while wallabies play kiss-chase with each other through the bush. The thought flew through me (and has yet to be dislodged) that Tasmania is an active oil painting – perhaps in the style of Constable or Turner – whose earthy colours seem to sway beneath a frayed cloak. Occasional moments like these render me with favour and afford me the unique pleasure I could enjoy while stood alone in the Tate. The roads that zip up the north west took in the rustic summer vistas, combining the Tarkine forest with scarred mountainsides. Days were progressive while nights were (forcibly) tranquil. Not far from Stanley was Dismal Swamp, a cheerful nature spot that is thankfully speared by a 110m long helter-skelter that carries visitors – at speed – to the swamp floor. If – like me – you imagined a swamp to be a gurgling green lake filled with creatures of The Unknown then alas, you’d be wrong. At face value it was much the same as any forest, but beneath it was a different long-winded story thanks to some burrowing crayfish. And not far from Dismal Swamp was The Edge – dramatic drum roll – of the World! Again, if – like me – you imagine this to be a four-mile high cliff with showers of flaming, fanged lemmings then alas-once-more, you’d be wrong. It was in fact a jagged, windswept stretch of coastline marked by a small plaque inscribed with a topical poem by Brian Inder about his discarded pebble. My initial impressions of Tasmania were borne of comparisons to other lands; Ireland for its emerald tone; Sri Lanka for its chic beaches; England for its rumpled charm; Canada for its elegant forests; Norway for its magic; America for its suppressive history; and New Zealand for its wilderness. It was hard to shake this mind game in the north west, I’m often guilty of it elsewhere. However there was an underlying knowledge that Tasmania is above all, unique. Where else can you stand on those beaches, breathing in the cool air before driving an hour or two along smooth ribbons of tarmac through ancient forests, then stopping to eat lunch in the shade of a 70-metre high gum tree, while all the time a wallaby spies on you from the bush? Only in Tasmania, my friend. 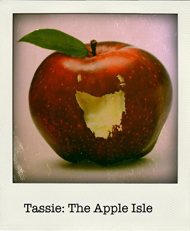 Have you visited Tasmania? Are there places you’ve been that you can’t resist comparing with distant lands? Share your thoughts through the comment threads.